When ordering from us, there are a few things we need to know. However, if you’re new to millinery and don’t know where to start we have included some helpful tips here. We’ve also put together some ‘block bundles’, with all the hard work of choosing done for you, but if you’re still unsure please just give us a call or email, we’re happy to chat and help you get going. Most of our hat blocks are made from European Lime and in order to keep the weight down we also use some obeche for some of the larger ones. Lime (Linden, Tilluer) has been the wood of choice for wood carvers since as long as people have carved wood, and many old hat blocks are made from it as a result. It is known for its easy carving qualities, its ability to hold very fine detail and its clean smooth texture. It is simply one of the nicest woods to work – and it even smells amazing too! But, it’s great attributes don’t end there – it also pins very easily and rather than being shipped half way round the world before we use it (obeche & tulip), it comes from a sustainable source in Europe. Our supplier is fully registered with PEFC, which is an organisation that promotes sustainable forest management – see www.pefc.co.uk if you would like more details. There’s nothing like finding a material for your job that you are simply delighted with, it makes the process even more pleasurable, and, it hardly needs saying that the better the quality of the raw material, the better the finished product will be. Of course that helps us to continue to provide you with the best quality hat blocks that you can buy. 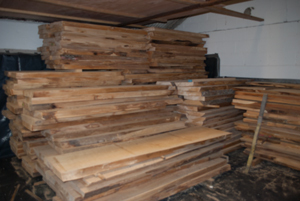 In the past we also used Tulip wood but the quality of the lime wood is so good that we don’t feel the need to use Tulip wood at all, and once again it’s great not to have to use timber that has to find its way accross the atlantic before we make blocks from it. We use the term ‘form’ for the shape of either crowns or brims at the headband position. We offer three different forms; slim oval, broad oval and circular. Most milliners find that the slim oval form provides a good head fitting. The form of the headband on the brim should not be confused with the outline, which of course can be cut to any shape you wish. We can also make blocks to custom ovals for your individual customers needs – feel free to ask. Crown blocks can be made in any of the forms except where stated otherwise. The choice between the three forms is really one of aesthetics. Broad oval crown tips have a pleasant full shape, which is even more pronounced with the circular form. Slim oval provides the best head fitting and in any case, even when using broad oval crowns, they would normally be fitted to a slim oval brim in order to give a comfortable fit. As such, brims are almost always made in the slim oval form. The choice is yours but if you’re not sure, just ask! All sizes are available, from child to large adult, and can be made in inches or centimetres. The size of your block should correspond to the required head size, however, there are various techniques that allow you to increase or decrease the size of the hat you are making. Many customers choose the standard size of 22.5 inches (57cm) and work from there. For men’s hats the most common size is 23 inches (59cm).